This is a sponsored post written by me on behalf of The Pencil Grip, Inc. All thoughts are my own. This post contains affiliate links. For more info please view my disclosure. Painting with kids can get messy. 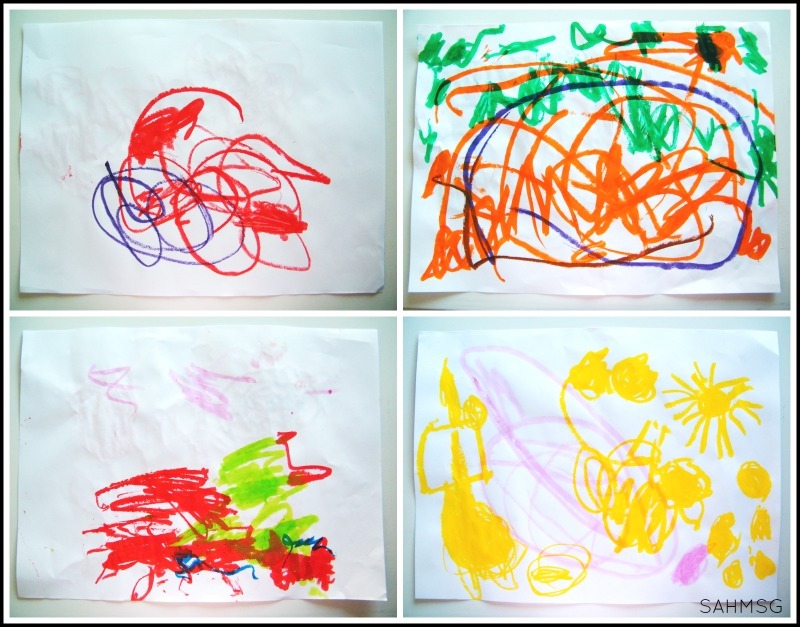 What if I told you there was a way to let kids explore painting that involves little mess? Normally I have to be in the right mood to let my kids paint. It takes time to get everything set up, it requires me to watch really closely so the paint and water do not drip everywhere, and then there are all the drying paintings layered on top of my kitchen counter. The clean up after can make me want to say “no” before any painting happens. 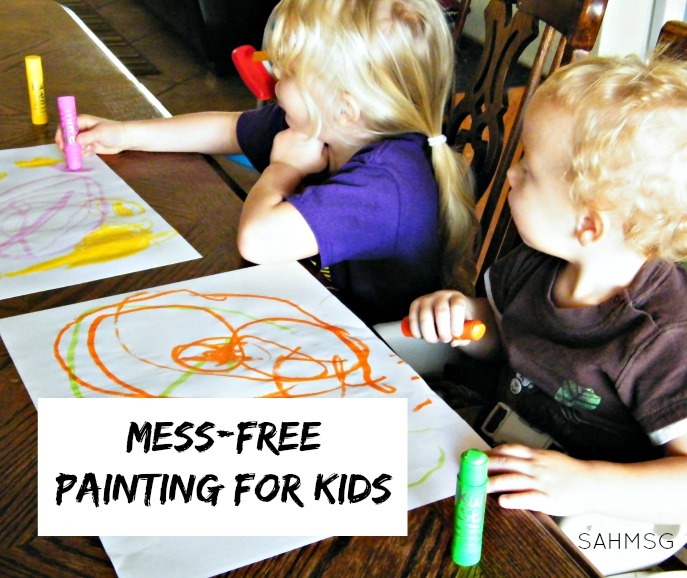 I know about a mess-free painting solution for kids. I just reviewed a product that is extremely affordable no matter what your budget…perfect timing for the holidays if you are looking for unique gifts for kids. These allow even toddlers to paint with little mess. 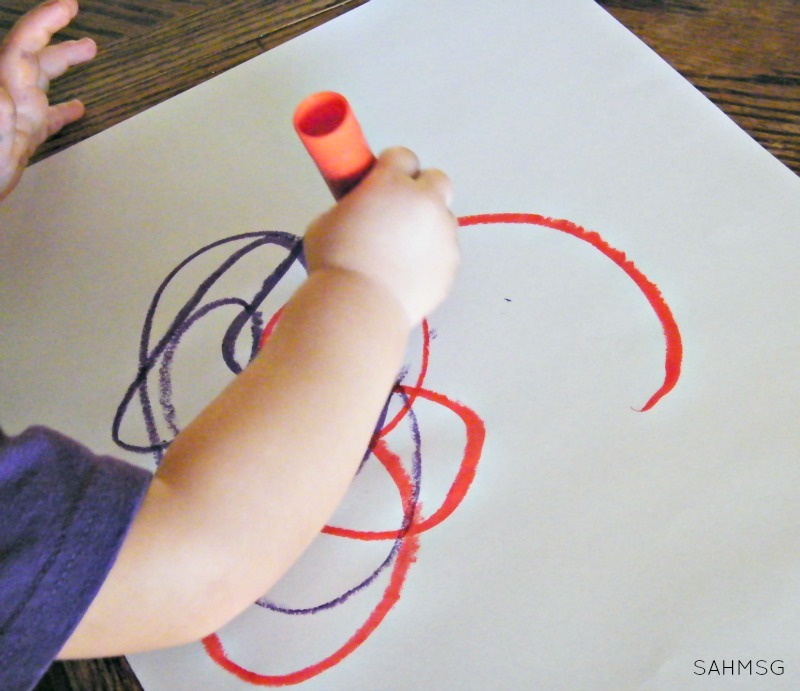 Kwik Stix tempera paint sticks allow for a no-mess toddler painting activity. Kwik Stix are tempera paint sticks that look like large lipstick tubes. The colors are brilliant, but they wipe right off skin AND tabletops. Kwik Stix are practically mess-free…and they are really affordable. I actually have a pack in a gift giveaway for you that you can enter to win at the end of this post. 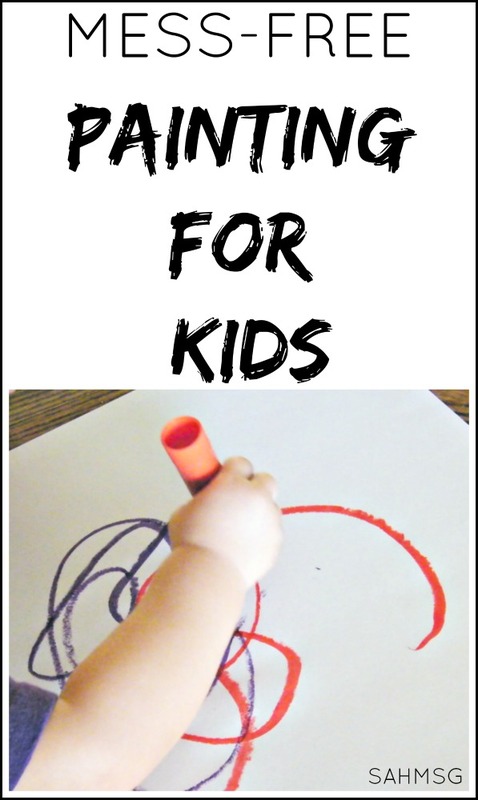 Let me show you what happened when my toddlers and preschooler created with Kwik Stix. I won’t lie, I had to try them too! The first thing I noticed was how brilliant the colors were. My children were really excited and focused on creating their paintings. There was no dripping, no spilling water, just creative artwork-even from the toddlers who are not yet 2! The size of the Kwik Stix were perfect for my toddlers. The color remains bright even after it is dry. There is no need to dip a paintbrush into wet paint to keep painting. Kwik Stix remind me of large oil pastels, but without all the smearing and smudging. The non-toxic tempera paint dries to the touch in a minute. 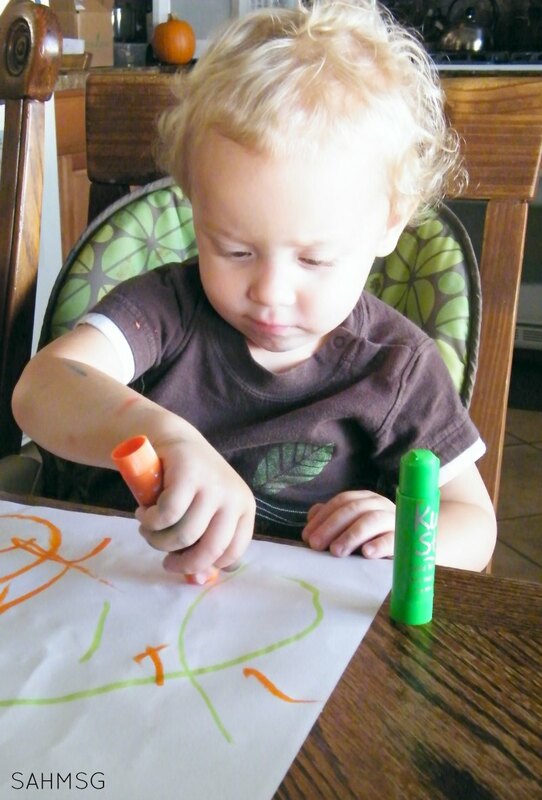 Unlike traditional tempera paint, there is no powdery residue with Kwik Stix paint. It dries with a no-mess finish. The colors are really vibrant! 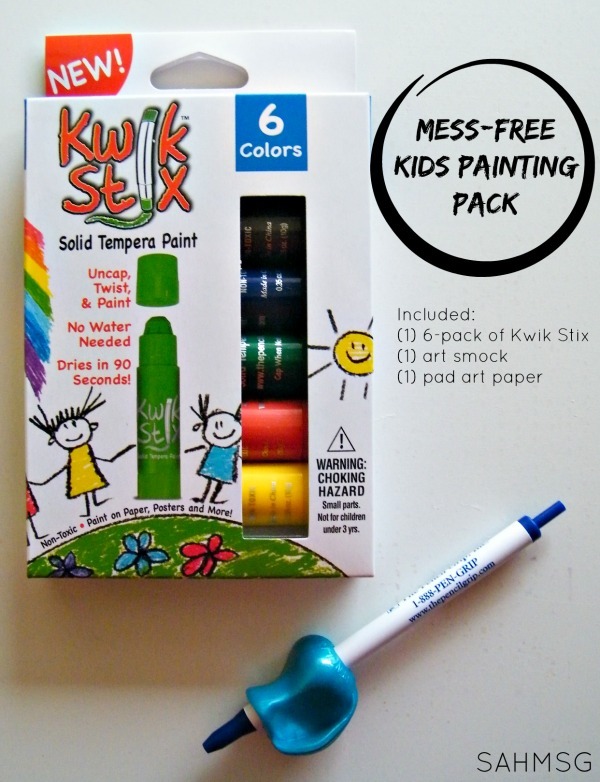 We tried out a 12-pack of Kwik Stix, but you can enter to win a 6-pack with a few other goodies to get your child painting and creating with little mess! We even used our Kwik Stix to paint pumpkins on Halloween. They were a great alternative to wet, drippy tempera paint. I think I enjoyed trying out Kwik Stix as much as my kids! You can find Kwik Stix on Amazon. There are 6-pack, 12-pack and 96-count sizes. Enter below for a chance to win your own Kids Art Package including a 6-pack of Kwik Stix compliments of The Pencil Grip.